A summary perusal of some of the other articles on this site – or a glance at the tag-cloud – will quickly reveal an inherent bias towards kits made by adidas. When I began to watch football, my three favourite teams, Arsenal, Cork City and the Republic of Ireland, all carried the three stripes, but it wasn’t just that simplistic: there was something about the adidas designs which set them above other manufacturers, to my mind. It’s a view still held, perhaps not as strongly as some of the more recent stuff has been bland, but the trefoil certainly arouses a strong feeling of nostalgia. This is especially the case when it comes to adidas goalkeeper shirts, which have a timeless quality to them, and that’s as good a reason as any to dedicate the site’s newest series to them (following the examination of the 1990-91 Serie A season). We begin with an absolute classic. The first major appearance for this new look was at Euro 80 in Italy, though at the time, manufacturers’ logos were not allowed. Spain took this to mean no makers’ markings at all, so Luis Arconada had a very plain version – no stripes at all – with a patch over the trefoil. Belgium’s Jean-Marie Pfaff didn’t have the adidas mark but did have the stripes. Slightly irritatingly, adidas missed an opportunity to get the stripes on Pfaff’s shirt to match up to their yellow-black-yellow-red-yellow pattern which appeared on the outfield kit, and Pfaff’s shorts (red stripe not visible). This would be rectified in future goalkeeper kits, as we will see). Two years later, when Spain hosted the World Cup, Arconada had a far jazzier version, with a modified collar – possibly a DIY job – and red and yellow stripes, though in reverse format on the shirt compared to the shorts. In Britain, the shirt wasn’t common, but there were a few appearances. In my head, Jim Leighton is the goalkeeper most associated with this ‘yoke’ design [edit – Simon Shakeshaft thinks that ‘dip-dye’ would be a better description], donning green and blue versions in his first spell with Aberdeen. 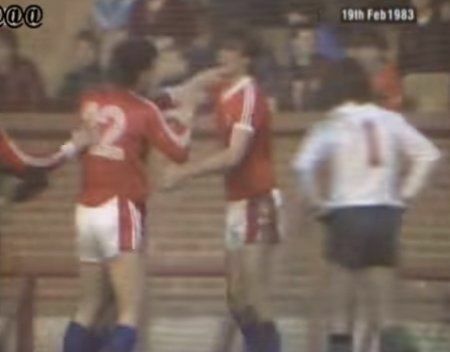 Wales were with adidas at the time too – like Aberdeen, they left and have since come back – and Neville Southall was seen in the same two colours and yellow. It was also, oddly, worn by England goalkeeper Ray Clemence against Romania in 1980, when his normal yellow jersey clashed with the opposition. Domestically, the rule still pertained that goalkeeper shirts had to be ‘self-coloured’ – i.e. no accoutrements at all – and the options were limited to green, blue, red and white. Incidentally, in 1982-83, Arsenal’s goalkeepers used all four options. 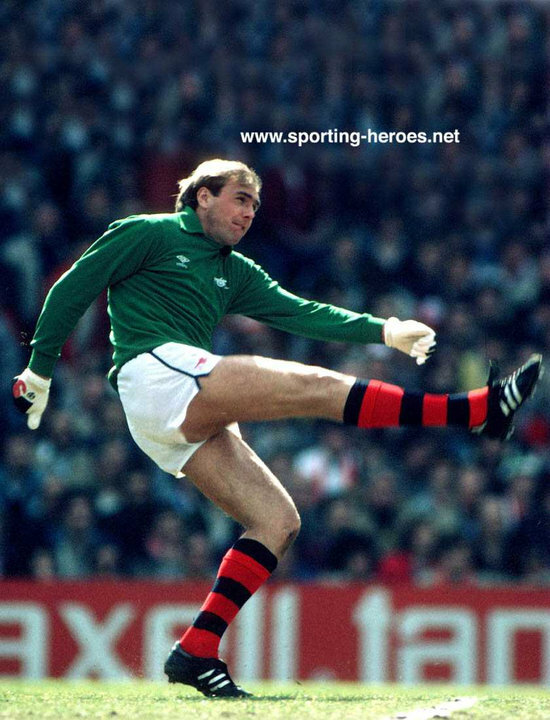 However, with less rigid rules in European competition, Ipswich Town goalkeeper Paul Cooper wore the green version, with matching shorts and socks, for the away leg of the 1980-81 UEFA Cup final against AZ Alkmaar, as a 4-2 loss meant they won the tie 5-4 on aggregate. Aside from the three most popular colours, orange (see below) was also half-common, while red was rarer though it was used by MSV Duisburg in Germany (left). There may have been a grey edition but match-worn examples haven’t been found as yet. An interesting variation was that worn by Hans van Breukelen of the Netherlands in a friendly against England at Wembley in 1982 (right). The design was officially deleted from the adidas catalogue in 1984, but there were other sightings, on the backs of Irish goalkeepers. Northern Ireland’s Pat Jennings didn’t wear it much but did have it on at Wembley in 1985 – it wasn’t until the late 80s that the North’s keepers stopped wearing the team shorts and socks. Then, a year later, the Republic signed a deal with adidas (not the first time the country wore adidas kits, but that’s for a later blog). A publicity picture just after the agreement with adidas – and Opel – featured a kit which was never worn in a game, while Packie Bonner and Gerry Peyton wore the yoke style (in one pic, anyway – for some reason they wore plain shirts too in the same shoot). Bonner had it on for Ireland’s first competitive game in adidas, the Euro 88 qualifier away to Belgium in September 1986. Yellow – and, famously, grey – would become more associated with Bonner, but for a short time in 1986, the Donegal-born Celtic player was an orange man (note the small ‘o’). More to follow soon as we look at subsequent adidas goalkeeper shirts. * Thanks to Jimmy from The Glove Bag and Rob Stokes for their help in researching this article. Hamish McAlpine also wore the blue version for Dundee United. Searched high and low for this shirt in the early 80s. If only we had internet then!